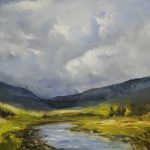 Oona’s childhood holidays were spent hiking in the Highlands of Scotland and installed in her a deep love of wild and unspoilt landscapes. 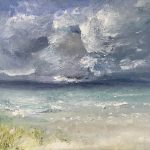 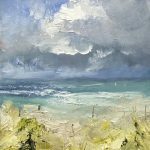 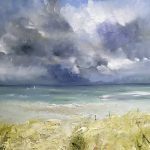 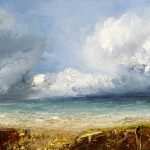 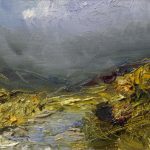 She is well known for her paintings of the Highlands and the West Coast of Scotland – windswept moorlands, mist enveloping the Grampions and the wild beaches of the Western Isles. 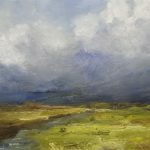 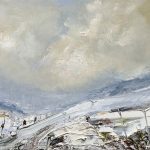 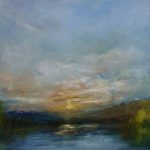 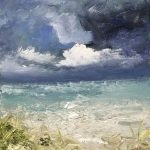 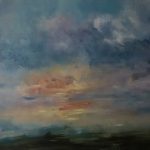 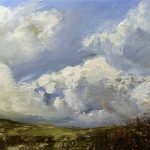 Her work is rooted in her love of romantic landscapes and her paintings recall a particular moment on a particular day when landscape and weather combined to leave a lasting imprint. 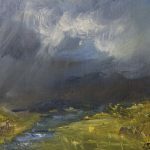 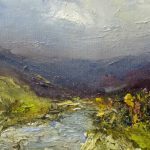 These recent paintings of Glen Lyon encapsulate her love of the Scottish Highlands. 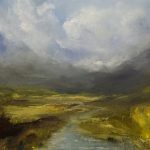 Oona has recently moved to Yorkshire and this landscape has become a new inspiration for her work. 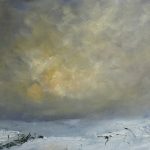 Having familiarised herself with the patterns of the dales, all was transformed this winter by the snow which brought a magical daytime wonderland of white; evenings of golden snow and golden skies; snow covered stone walls and solitary farmer’s footsteps.